Legislation introduced in the House of Representatives last week is calling for gold and silver commemorative coins in honor of the 150th anniversary of the Carson City Mint. Congress established the Carson City Mint in 1863 to serve the coinage needs brought on by the Comstock Lode during the silver rush in Nevada. It opened in December of 1869 and produced its first coins on Feb. 11, 1870. Its formal mint status was withdrawn in 1899 due to the drastic decline in mining on the Comstock Lode. Introduced June 26 by Rep. Mark Amodei (R-NV), the Carson City Mint 150th Anniversary Commemorative Coin Act of 2018 (H.R.6221) is seeking up to 100,000 $5 gold coins and a maximum of 500,000 silver dollars in collector qualities of proof and uncirculated for issue during calendar year 2020. Their designs would be emblematic of the Carson City Mint building, its importance to Nevada and the Nation’s history, and its 150th anniversary. Under the terms of the bill, a surcharge of $35 per gold coin and $10 per silver dollar would be added to each coin sale. Collected funds, provided the commemoratives turn a profit, would be paid to the Nevada State Museum Dedicated Trust Fund to support the Museum’s mission. 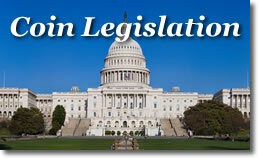 H.R.6221 has been referred to the House Committee on Financial Services. It will become law if it passes in the House and Senate and gets signed by the President. For the $1 Comm.., just strike a Morgan with an emblematic ‘CC’ on it – Big Winner! For the $5 Comm.., just stike a Half Eagle with an emblematic ‘CC’ on it – Bigger Winner! Nah…, who am I kidding, the CCAC & CFA will come up with some lame design for the Obverse and some ‘PC’ Native American rain dancer or something on the Reverse. Given the recent and systemic trend – if passed and authorized, this Comm would turn out a dud. Probably best that they just put a Dude Ranch on the Obverse and the Bunny Ranch on the Obverse of the $1, would be a better seller than what we’re likely to get. A salute to Chinese Immigrant rail workers getting paid in “CC”s…..or maybe a cheesy poorly dene enhanced or reversed proof, oh they did that alreaady…..
CC mint still has #1 press . It wood be really cool if they struck the coins there. Then I would buy one or more. CC to the mint means: Can’t Comprehend. The Carson City Mint in Nevada no longer belongs to the U.S. Mint. It is now owned by the State of Nevada & is a museum with one old coin press. Since states cannot produce coinage under U.S. law, it won’t happen in that way. This would be great I wish this would happen.